Eggs! It’s What’s for Dinner?! Aren’t eggs supposed to be the super protein that kick starts your mornings? Did you know that eggs are only eaten for dinner and not breakfast in Czech Republic? According to Bowling Champion, Tomáš Novotný from Varnsdorf this is a simple fact as he tells SusieQ FitLife in plain English. So, we decided to put a scary spin on those eggs with a dose of green & red bell peppers to see if it will excite the olympic athlete in all of us! Here’s a light meal that will be a perfect way to end your day, especially if you’re short on time. Six grams of complete protein is packed into every large egg with only 72 calories. 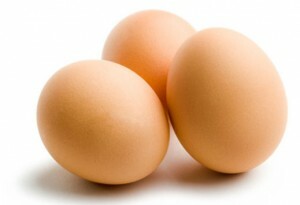 In fact, three large eggs are equivalent to the nutritional value of a 5-7oz serving size of lean meat! Wow! That’s what’s for dinner! Vegetables are complimented when you add eggs to the meal, similar to omelets! Whether you prefer a spicy scrambled egg dish with splashes of salsa or simplified with zucchini and basic produce items; we are about to mix up your main menu! Let’s scare the peppers, beat the eggs, toss the tomatoes & wake up those yams! This dish is inspired for many FitLifers who need a refreshingly new way to have a satisfying meal! SusieQ FitLife Recipe to GO! 1. Steam the yams/sweet potatoes over boiling water for 10 minutes or until tender & remove from heat. 2. Add extra olive oil to heated nonstick pan and add finely chopped red onions. Stir until it softens and cooks for approximately 3mins. Add all peppers and continue to sauté for 5mins. Include garlic, tomatoes, cayenne pepper & additional pepper seeds. Stir together and simmer for 2mins. Reduce heat to medium/low, stir and cook for 20-30 minutes, until the mixture is tender. Add sweet potatoes. 3. Beat eggs to perfection in a bowl and pour onto vegetables. Continue to stir until the scrambled eggs are cooked. Remove from heat. You are now ready to serve; Watch Your Mouth & Get a FitLife! Next week, we will also find out if Men are really cooking in the Kitchen! FitLifer, Sampson Paul Adamah Mensah says he is cooking up a storm! We will also give you all the health benefits to every carefully selected ingredient within this Scary Healthy Green Pepper recipe on Watch Your Mouth Wednesday! If you have a FitLife Recipe you’d like to share to be included on our FitLife Family website; simply post on our Facebook page or within the comments below & it may be selected in our next featured article! Congratulations to our winner of the John Deere Apron Contest from the Buffalo Gals Bakery!Lisbeth Gomez! This is Lisbeth’s very first apron & we wish her the best of many future FitLife Meals for her family; including her beautiful twins (Camilla & Liaila) and her hungry husband, Juan! Thanks for getting a FitLife with us! 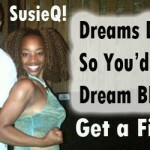 Our Buffalo Gals Bakery Contest SusieQ FitLife Winner is Lisbeth! Thank you so very much SusieQ. I believe this may just be my dinner tonight! I think I’ll add a few mushrooms and spinach also!! !